The asari, native to the planet Thessia, are often considered the most powerful and respected sentient species in the known galaxy. This is partly due to the fact that the asari were the first race after the Protheans to achieve interstellar flight and to discover and inhabit the Citadel. A mono-gender race—distinctly feminine in appearance and having maternal instincts—the asari are known for their elegance, diplomacy and biotic talent. Their millennia-long lifespan and unique physiology that allows them to reproduce with a partner of any gender or species, gives them a conservative but convivial attitude toward other races. The asari were instrumental in proposing and founding the Citadel Council and have been at the heart of galactic society ever since. The asari are a bipedal species that hold one of three permanent seats on the Citadel Council. All asari are mono-gendered, although they display, from a human point of view, female characteristics, with the ability to bear and nurse children. Their reproductive and dual nervous systems allow them to mate with any species or gender, with whom the offspring is always female and of the asari race. The asari are capable of participating in and enjoying physical sexual contact. However, to produce offspring, they form a mental and spiritual connection with their partners, and by doing so, draw genetic material which is combined with their own to produce offspring in a form of hybridogenesis. Sexually, the asari could be considered as xenophilic, as not only are they indiscriminate in regards to the races of their mates, but prefer to mate with other races, believing that the genetic and racial traits of other species, when combined with asari genetic make-up, is of benefit to the asari race as a whole. Conversely, they tend to attach a stigma to those born "pure blood" between two asari, as they believe that nothing is gained when two asari procreate (although most are too polite to openly speak of their prejudices). Their home world's name is Thessia and is comprised of an interconnected system of city-states, similar to medieval Italy. Of all the species in Council space, the asari are the most widespread, powerful, and respected, due in part to their being the first species since the Protheans to achieve interstellar flight, to discover and learn how to use the Citadel, and their position as a founding member species of the Citadel Council. Despite this, the asari are open in their service to others, to the point where there is no cultural stigma attached to performance arts, even sexual ones. This has led to salacious rumors of asari promiscuity, which they consider unfounded. Of all the galactic species, the asari are the most economically powerful; their culture, products and entertainment dominate the galaxy. They are governed by a loose democracy, known as the Asari Republics, and are known to be politically centrist, favoring stability that is conducive to cultural and economic development. Politically, they practice a form of direct democracy that could only be described as an e-democracy, where citizens contribute to the general consensus via a huge interconnected network. However, they also have a matriarchal council that heed the will of the people and make decision for their welfare accordingly. The asari can live for a thousand years going through three stages in life; the Maiden stage (lasting to 350 years,) an energetic phase in life in which an asari is growing up and setting the initial course of her life; the Matron stage (lasting from 350-700 years) where an asari draws back to a more deliberative phase and begins to lay the foundations of a family and her place in society, and finally the Matriarch phase (700-1000 years) where the asari takes her place among the elite in society, participating more in cultural and political affairs and generally leading the next generation to fruition. Asari are physically similar to humans, averaging 1.5 to 1.7m in height and about 55kg. Their skin ranges in hues of blues and greens. Their hair is typically the same color as their skin. Asari posses the most advanced and powerful forms of Biotics known amongst the Citadel Council Species and with age their power and knowledge of all things Biotics grows. Though renowned for their diplomatic abilities and openness towards mating, this by no means should suggest a racial weakness for combat prowess, Asari who choose to learn the ways of martial combat spend centuries training and developing many forms of hand to hand, modern ranged and fleet tactics. The Asari Commands are regarded as some of the best and most lethal combatants in the Galaxy. The average age for a maiden found in the Galaxy is 100-300 standard years. Asari can live to be over 1,000 years and have three stages to their life: Maiden, Matron, and Matriarch. In the Maiden stage, asari seek to go out and learn as much about the galaxy as they can. Military service is also common in this stage. In the Matron stage, asari seek to mate with interesting partners in order to have daughters of their own. The Matriarch stage grants an Asari great power and influence over other asari as they will defer to the wisdom of the Matriarchs in times of crisis. Typical asari individual has a blue to purple complexion; the gas giant Sharblu was named after a famous asari soprano with a distinctive skin tone that resembled the planet's atmosphere. Some Asari can also have a teal complexion, but this seems to be a rarity. 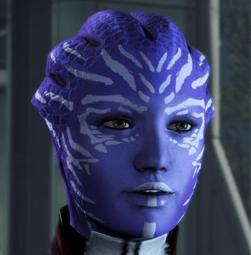 Some asari have facial markings, which are unique color patterns that vary for every asari. Some of these facial markings are associated with eyebrows by humans, but the asari do not think of the markings as such themselves. In the place of head hair, asari possess semi-flexible, cartilage based scalp crests that grow into shape. These structures are rigid, and do not "flop around" as some believe. Asari are naturally biotic. Some choose not to develop their innate abilities but they comprise less than 1% of all Asari. Many choose instead to hone their biotics and become extremely powerful. Even of great renown outside of Asari society. Asari do not require Biotic Amps to control their Biotic Talents. Asari begin character creation with 1D in Biotics. During character creation, Asari get 2 biotic talents for every 1D in the Biotic attribute (instead of 1 per 1D). This is a vile and vicious act and if used too often it will incur the full wrath of the Asari people and Citadel Spectres. Using this ability costs 3 Character Points and if used against someone’s will awarded with Renegade Points. Asari entry at Mass Effect Wiki.